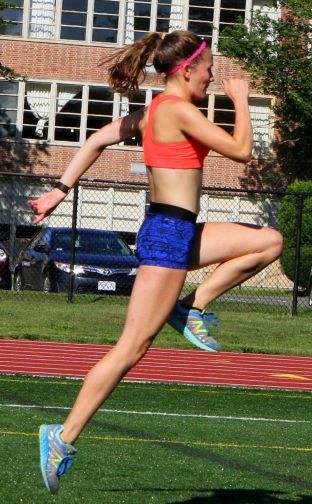 GTD: Emily, you first came to Coach Braz's cross-country conditioning program in the summer of 2013, before your sophomore year at Ipswich High School. At the end of that summer program, you decided to continue working with Coach Braz. How did that happen? GTD: Each XC course is different. You've run on all the Cape Ann League courses as well as many others. What is it that you like and dislike about a course? Favorites? Emily: My favorite course would probably be Patton Park which is Hamilton Wenham's course. It has a huge hill at the end of the course. I feel like that is a great point to make a move during the race. I really like courses that have pretty scenery. Also I strongly dislike when a course's surface is super rooty or rocky because I constantly twist my ankles. GTD: In your Junior year you were one of two athletes in the state who finished in the top 10 in three track events -2:56 in the 1000, 5:02 in the mile, and 11:06 in the 2-mile, which you brought down to 10:59 in the spring. What's your favorite event? Emily: In indoor track my favorite event is probably the 1,000 meter. I really enjoy its combination of speed and endurance. In outdoor I really enjoy the mile. I feel like the mile is "the event" in outdoor track. Emily: I feel like to be an elite runner you need to focus on nutrition. I believe you can't train hard and eat lousy. Each day I prepare and plan out healthy meals for myself. I try to incorporate lean protein sources, lots of fruits and vegetables and healthy fats. Eating right is part of a healthy lifestyle that gives me the energy I need to train hard. GTD: During the summers, you've been in the GTD XC program, and you've continued training with Coach Braz throughout the year. Can you describe some of the training? GTD: You've accepted a scholarship to run at Boise State. The Broncos are a Division 1 school with women on their xc team from Finland, England, South Africa, and all over the West Coast, including Alaska's Allie Ostrander. But you're their first recruit from east of the Mississippi. How did this happen, and what attracted you to Boise State?